Also known as Tango no Sekku or Feast of Banners, Children’s Day has long been held to wish for the health and success of young boys and fathers, thus it became associated with masculinity. In 1948 the government decided to make the day more inclusive and decided to celebrate girls and their mothers too. The day was then renamed ‘Kodomo no Hi’ or ‘Children’s Day.’ Families all over Japan take time to think about the importance of kids and parenthood while enjoying traditional delicacies. 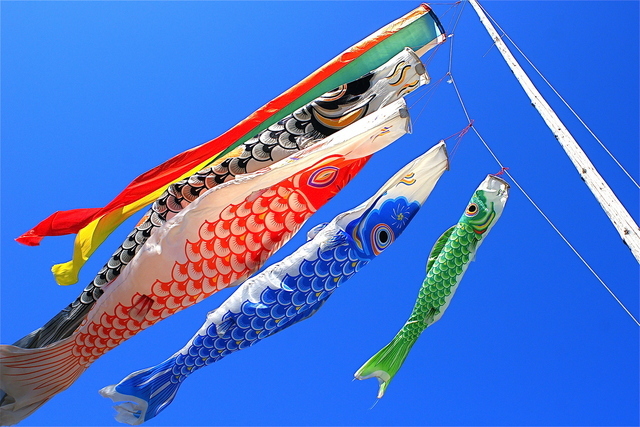 If you’ve ever visited Japan in April or May you may have been lucky enough to spot these colourful koinobori carp flying above homes across Japan. A symbol of strength, health, courage and success these colourful decorations are flown in honour of boys in the family with the number of fish usually corresponding to the number of sons and their father (and on some occasions mothers too!). These streamers have a wealth of cultural associations attached to them. In Chinese mythology there are stories about a carp that tried so hard to swim upstream it eventually turned into a dragon. Children’s Day also has strong historical ties to samurai values, and some families display hand painted banners with family crests echoing those worn by historical Japanese soldiers. If you’re a bit crafty, you could try making your own papercraft carp streamers. Find out how here. Another awesome Children’s Day decoration is the kabuto. Patterned after traditional samurai armour kabuto helmets, these displays often include a full set of armour. However these days most people don’t have the room (or money) for such luxurious displays. If you want to create your own kabuto, you can make an origami one with newspaper. For more info click here. A traditional snack on Children’s Day, kashiwa mochi is made from deliciously chewy glutinous rice wrapped around red bean paste and covered in an oak leaf. If you’d like to make your own kashiwa mochi, check out our easy recipe. According to some legends Kintaro was raised on Mt. Ashigara (on the border of modern day Shizuoka and Hakone prefectures) by a mountain witch. With fantastic strength, a friend to animals of the mountain, and a formidable foe to demons and monsters, it’s no surprise that dolls of his likeness are displayed in homes on Children’s Day. Don’t forget to check out our Children’s Day display and limited edition treats in Japan Centre store, Piccadilly. Want your kids to turn into metaphorical (we hope) dragons? Want to celebrate with some cool limited edition Children’s Day candy? Head down to Japan Centre and unleash your inner bear riding, upstream swimming self. 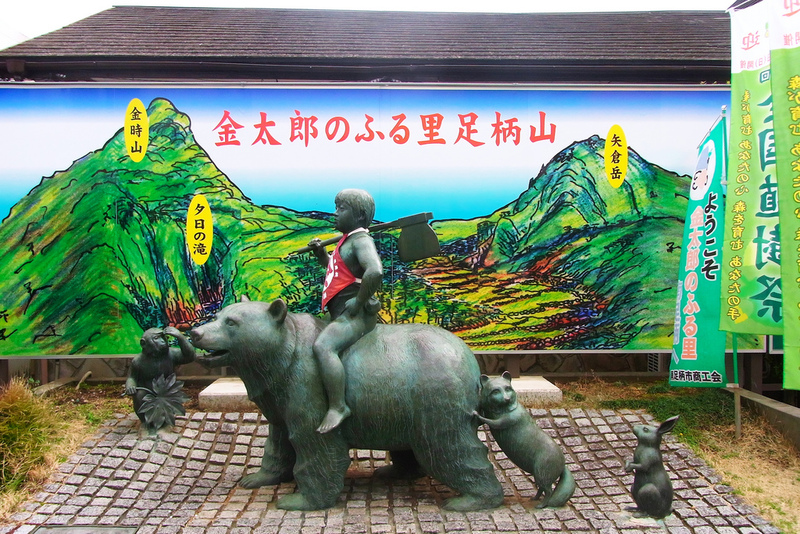 Thanks to norimutsu nogami at flickr for the image of Kintaro on a bear. Thanks to Daniel Welch for the koi image. 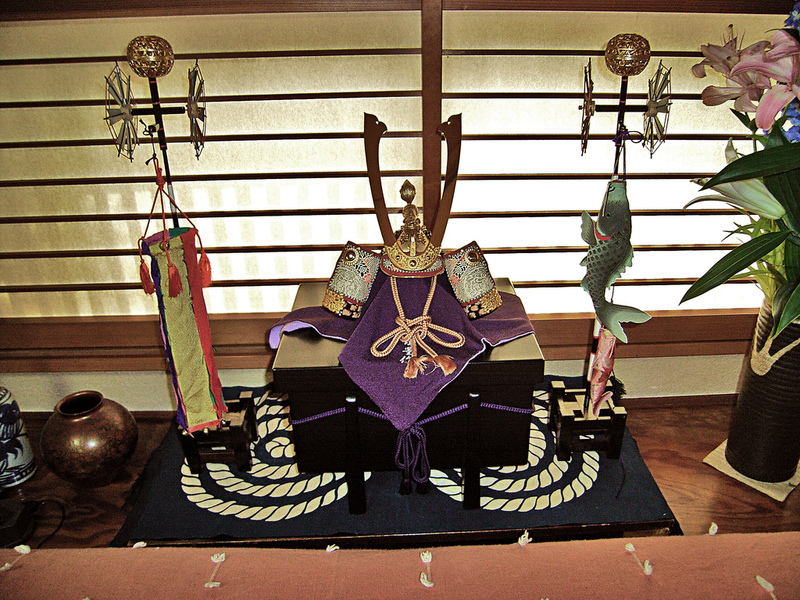 ThanksC Smith at flickr for the image of the kabuto display. Posted in Culture and tagged boy's day, Children's Day, festival, matsuri, tango no sekku. Bookmark the permalink.